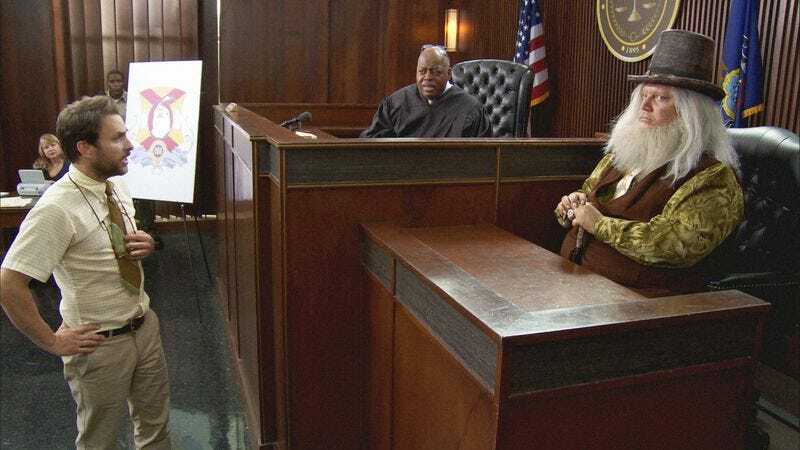 "McPoyle vs. Ponderosa: The Trial of the Century"
Uncle Jack. The Lawyer. Bill and Maureen Ponderosa. The entire McPoyle clan (except for the really funny ones). Bird law. If there’s one thing “McPoyle vs. Ponderosa: The Trial of the Century” can’t be accused of, it’s neglecting fans of It’s Always Sunny In Philadelphia. Essentially, this season 11 episode is one long, crowd-pleasing reward for watching the first 10 seasons. It’s funny, it’s affectionate, it’s gross, it’s cartoonish, and it’s helped clarify what’s been bugging me about this season overall. The best Sunny episodes burrow. They find the black, twisted soul of the Gang and watch them squirm their way through misadventures based on their collective concept of appropriate daily behavior. The episodes this season have—as funny as they’ve been—skated along across the top of the awfulness. They’ve been conscientious, worshipful even, paying homage to beloved past episodes by ticking off references and callbacks aplenty. Even the episodes that have stood more or less on their own (“The Gang Hits The Slopes,” “Being Frank”) have been stunts—pretty effective stunts, but stunts nonetheless. It’s hardly the imitative mess of, say, Community’s infamously Stepford Wives-esque fourth season, but there’s been a constant hum of the effort of trying to replicate what works this season, rather than the satisfyingly appalling grinding of the show digging deeper. So here we get, for the second episode in a row, Lance Barber’s Bill Ponderosa, now at the center of a court case calling back to that time he put bath salts in the milk at Liam McPoyle’s wedding to his sister Maureen. (That’s Bill’s sister—when the McPoyles are involved, it’s wise to be very clear about familial relationships.) The McPoyles are there en masse (but for Liam and Ryan—the lack of Jimmi Simpson and Nate Mooney’s hilariously gross McPoyle brothers is a major disappointment), suing Bill for the loss of Liam’s eye—to the tune of 200 dollars. According to bird law, three strikes and you’re out! Bye, bye birdie. Ready boys and girls, because this is where it gets good. Ryan McPoyle didn’t attack Liam—Royal did. And Lion was lying about Royal attacking Liam to protect Royal from the chair. Or lethal injection. Or perhaps some sort of small bird guillotine. I wouldn’t understand the physics of it—I’m not an executioner. I’m just the best goddamned bird lawyer in the world. Indeed, all the courtroom stuff is solid, with Dee predictably failing to follow through on her perjury once The Lawyer reveals that Bill’s fur coat bribe is muskrat (bought, of course, from a McPoyle) rather than mink. She also buries Charlie’s case deeper when her convoluted plan to prove The Lawyer a liar by showing that he’s hiding some Jewish heritage sees her spewing apparent ethnic slurs all over the courtroom. (“That makes you a dirty liar, because you are Jewish! I mean, this dirty liar is a Jew—ish man.”) It’s always grounds for laughter when one of the Gang lets their innate prejudices slip out and then spends excruciating moments trying to extricate herself, and Kaitlin Olson’s face during the ordeal is outstandingly frozen while her eyes dart desperately for escape. And Mac—shunted into more childishly vulnerable role this season—looks for any way to join in the fun, promising to exhibit “hero cop Mark Fuhrman thinking and sort of transition into a Kaeto Kaelin” as he searches for the “bombshell” evidence that will bust the case wide open. (“You guys don’t have a bombshell?,” he asks incredulously, as Charlie deadpans, “I wish you would do none of it.”) In the end, his plans come to naught as well, although that’s more a function of the fact that the McPoyles are even more bizarre in their habits than heretofore imagined. Plus, Mac joins Dennis in the club of those who have manipulatively slept with mute Margaret McPoyle (Thesy Surface) to no useful purpose. Dennis is shoehorned into the proceedings trying to get the beleaguered judge (Reginald VelJohnson!) to cancel his alimony payments to ex-wife Maureen (Catherine Reitman) who has now gone full cat, while Frank does drugs with AA sponsee Bill (which he buys from Bill’s juvenile delinquent son). When Charlie’s defense ends up working, it’s mainly because the whole case is full of loony-birds, but he does uncover (literally) the actual, eye-gouging bird under the hat of delusional witness Pappy McPoyle (a returning Guillermo del Toro!) and pin the crime on the swallow (which does eat The Lawyer’s eye, furthering the Gang’s unremitting destruction of his life). Again, Day makes Charlie’s surprising competence (lets call it half confidence, half the world being insane) undeniably funny (“Chicadee-dee-dee, little bird, let’s dance”) and the whole episode clips along entertainingly. It’s also over-the-top, and the parade of in-jokes gets thin, rendering “McPoyle vs. Ponderosa: The Trial of the Century” less memorable than a really great It’s Always Sunny would be. 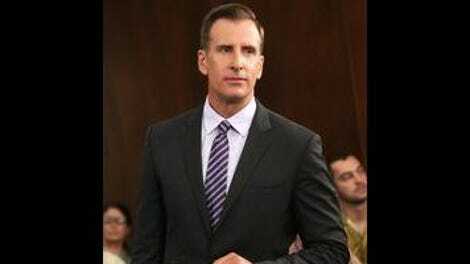 Halfway though the episode—after accidentally launching one of his hand-gloves across the courtroom—Uncle Jack appears with them duct taped to his sleeves. That’s Sean Whalen as newly introduced Ryan McPoyle lookalike brother Lion McPoyle. He has me fooled, too.